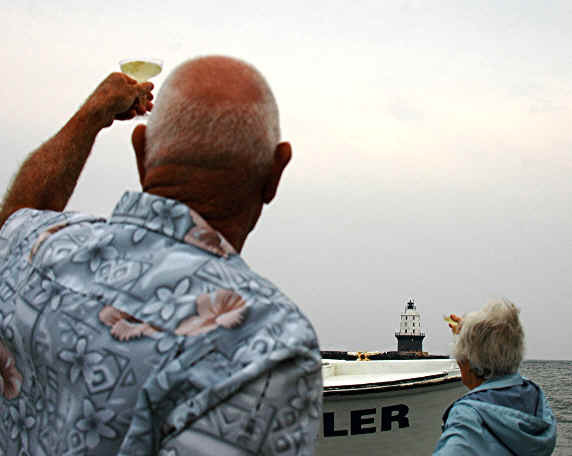 Ralph Walke of Dewey Beach and 93-year-old Emma Charske of Sun City, AZ, join in a champagne toast celebrating the 100th anniversary of the first lighting of Harbor of Refuge Light Station. 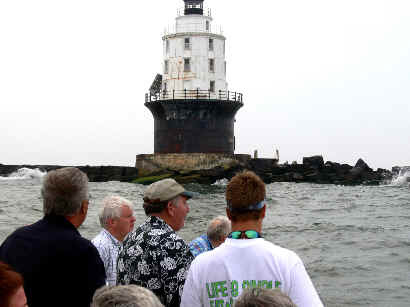 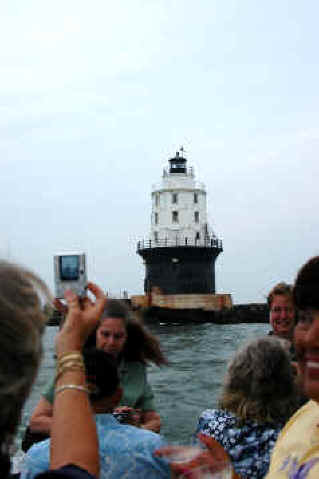 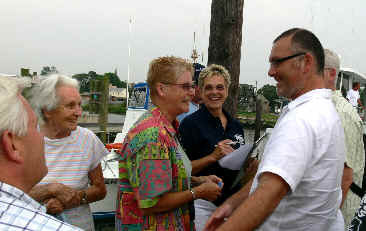 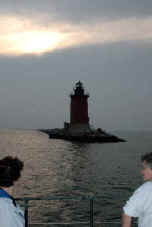 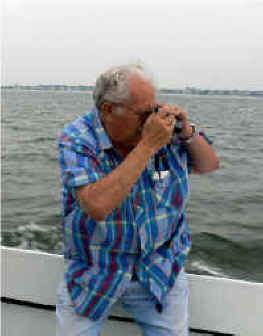 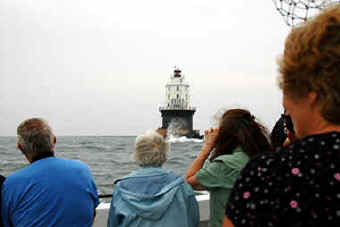 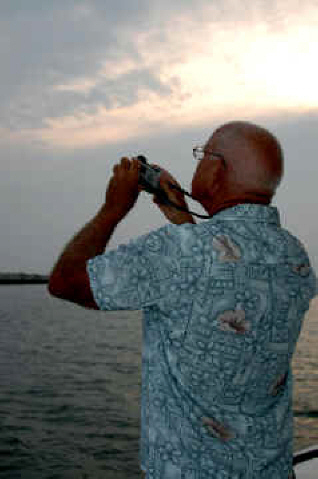 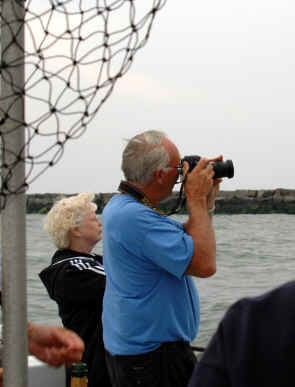 Nearly 100 people boarded three vessels chartered by the Delaware River & Bay Lighthouse Foundation for the 2008 edition of this annual photo cruise around the two lighthouses off Lewes. 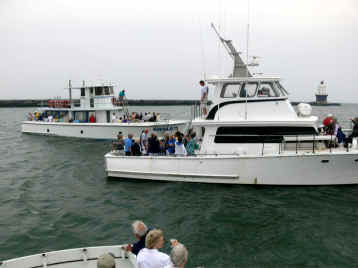 Foundation's cruise boats -- Capt. 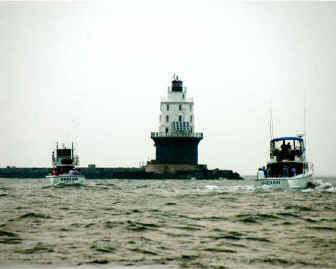 Ted Moulinier's Angler, Pirate King, and Indian -- rendezvous at Harbor of Refuge Light Station for the celebration. 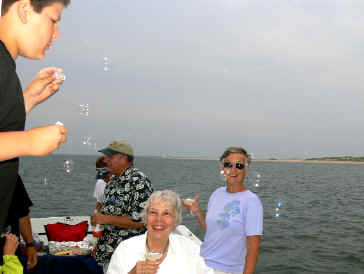 To commemorate the 100th anniversary of the first lighting of the first "permanent" Harbor of Refuge Light, cruisers made a champagne toast "To 100 Years of Light", blew bubbles, and sang Happy Birthday. 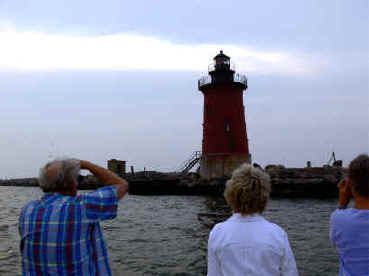 Although the sunset was pretty thin, cruisers were grateful that predicted foul weather didn't materialize....and photography was rampant. 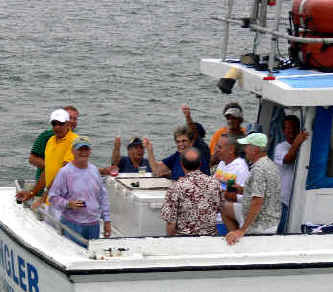 Party organizers Sandra Pace (center in print shirt), Judith Roales (in navy shirt), and Ruth Africa (with bullhorn) get cruisers ready for the festivities.